Exercise is a fun part of the daily routine for Scott Rogers' two Golden Retrievers, Nike and Mia. Friendly Mia, left, greeted a terrier with a kiss one day at the Mililani off-leash park that Roger's takes his pets to every day. 1. Follow your veterinarian's recommendations for vaccinations, especially for puppies. 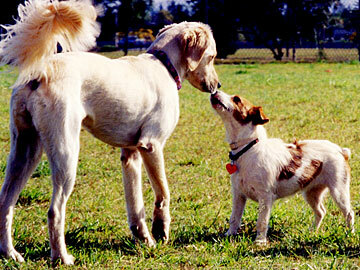 Many canine diseases are easily prevented through vaccinations that begin at puppyhood and continue as your dog ages. Parvovirus is quite common in Hawaii, contagious among puppies, and can be deadly. Your veterinarian will tailor a program of a broad range of vaccinations to help your pet maintain a lifetime of protection from infectious diseases. 2. Feed your pet a proper diet and address weight issues early. Most dogs, like people, love to eat, so meals and treats should be regulated. A good rule is to feed your dog according to the recommendations listed on the food container. Adjust amounts depending upon the volume and types of treats you give. Puppies need a special diet until they are about a year old; seniors have other requirements. If you notice weight gain, discuss your pet's feeding and exercise routine with your veterinarian. There is no such thing as a "fat and happy" dog. Improper diet can lead to health problems serious enough to endanger their lives. 3. Spay or neuter your pets. While both spaying (for females) and neutering (for males) are major surgical procedures, they are the most common performed by veterinarians. Both operations improve long-term health and prevent unwanted litters. It is a myth that females should have one litter first or that "fixed" pets will get fat. Having your pet sterilized is an important part of responsible pet ownership. Oahu's Neuter Now program provides low-cost surgery for Oahu dogs and cats; other island humane societies have similar programs. 4. Give your dog a regular heartworm preventative. Hawaii's tropical climate means mosquitoes are with us all year, so heartworm prevention is an every-month must. Heartworms are transmitted from animal to animal by mosquitoes. Once introduced into the dog's bloodstream, the worms can cause irreversible injury to pulmonary vessels and the heart. The disease is treatable, but as with most medical problems, the best defense is prevention. 5. Control external parasites such as fleas, ticks and mites. Warm, humid weather is perfect for breeding parasites that can cause much more than just discomfort. Worms are spread by fleas, ticks spread ehrlichia and cause anemia, and mites create intense itching. Prompt treatment of parasites lessens your pet's discomfort, decreases the chance of disease and reduces infestation inside your home. Your veterinarian can recommend preventatives for most parasites. 6. Provide exercise and an active routine for your dog. Exercise, then rules and boundaries, and lastly affection are what dogs need, and in that order. Take long walks and get enough exercise to tire out your pooch, especially before you leave them home while you work. Always use a leash, not just because it is the law, but for the animal's safety. Remember to take along a plastic bag and clean up after your dog. 7. Take your dog to puppy class and use positive reinforcement. Training classes are a great way to socialize your puppy. Make sure to choose a class that doesn't promote punishment. Negative physical discipline can adversely affect your puppy's attitude toward people. The humane society recommends that you visit a class before you sign up, see the techniques used and ask those in attendance if their dogs enjoy the experience. 8. Keep your dog's identification up-to-date. Dog licenses are required for all Oahu dogs 8 months and over. Two-year licenses begin Jan. 1 at a cost of $28.50 or $10 for sterilized dogs. Purchase or update your dog's license at any satellite city hall or at the Hawaiian Humane Society. A microchip ID is your pet's best lifelong identification. If you have moved or changed phone numbers, update your record in the humane society's database. "Pet Ohana" runs the first and third Fridays of the month. The Hawaiian Humane Society is a nonprofit agency dedicated to preventing cruelty to animals. It is located at 2700 Waialae Ave. Call 946-2187.